The founder and designer of smARTWORKS, Sonya Mackintosh is drawn to textures, colors, and patterns found in nature. 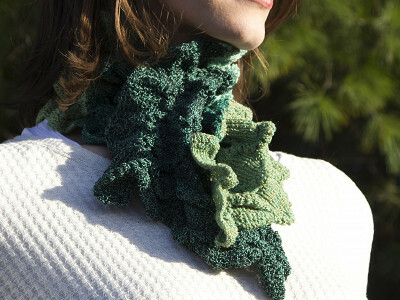 She finds inspiration in the beautiful Berkshire Mountains in western Massachusetts where she and her team use knitting looms to create soft, nubby scarves that add a unique mix of sophisticated style and cozy comfort to any outfit. 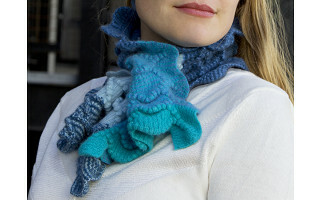 In addition to rich hues and textures, there’s something else that sets smARTWORKS scarves apart. Each one is designed with a keyhole to ensure it stays right where you want it—snug and secure around your neck. No fidgeting or re-wrapping necessary. 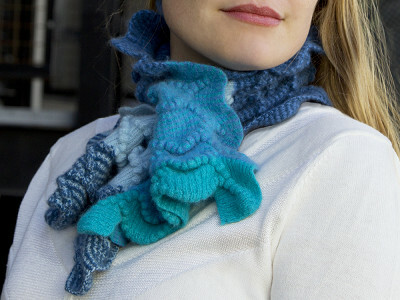 Put one on and it stays on—now that’s a scarf worth holding onto. Waves of luxurious cashmere in eye-catching colors that softly surround the face. Hello, I am Sonya, the designer and founder of smARTWORKS, Inc. where our signature scarves featuring funky textures, bold shapes and vivid colors are born. Each scarf is carefully crafted in our studio in the Berkshires of Western Massachusetts and adds an element of panache to your wardrobe. I am available today and pleased to respond to questions and comments. The founder and designer of smARTWORKS, Sonya Mackintosh is drawn to textures, colors, and patterns found in nature. 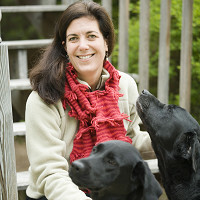 She finds inspiration in the beautiful Berkshire Mountains in western Massachusetts where she and her team use knitting looms to create soft, nubby scarves that add a unique mix of sophisticated style and cozy comfort to any outfit. In addition to rich hues and textures, there’s something else that sets smARTWORKS scarves apart. Each one is designed with a keyhole to ensure it stays right where you want it—snug and secure around your neck. No fidgeting or re-wrapping necessary.